Northants head coach David Ripley is playing a game of wait and see before fully judging the performance of his bowling attack on the first day of the Specsavers County Championship Division Two clash in Cardiff. The home side amassed a whopping 433 for four at Sophia Gardens, with Marnus Labuschagne, Billy Root and Kiran Carlson all smashing centuries. For Northants, pace bowler Blessing Muzarabari claimed two wickets on his Championship debut, and there was a wicket apiece for Nathan Buck and Jason Holder. But there is no denying it was a day of toil for the County attack. Ripley says it is too early to say whether or not the game has got away from his team, although he admitted his team will have to up their game on day two. 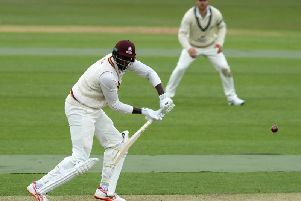 “I thought the Glamorgan batsmen played very well, and until we see both teams batting then we will know how good the pitch is,” said the Northants coach. 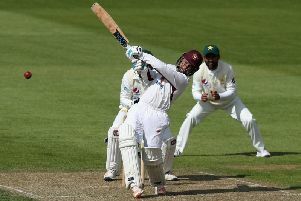 Labuschange, who scored 121 on his debut for the Welsh county, admitted it was a good pitch to bat on, and that his team will now aim to pile the pressure on Northants when they come to bat. “It was the perfect start for me, you look forward to the first innings and there is a lot of expectation,” he said. “It was a good pitch, and I felt if you did the basics well the runs would come. We will kick on tomorrow and hope our bowlers can put pressure on their batsmen”. As well as Labuschange hitting 121, Root, the brother of England skipper Joe, scored an unbeaten 126 and Carlson 101 not out. Labuschagne, who appeared in five Tests for Australia against Pakistan last winter, played a chanceless innings, scoring his runs from 177 balls with 19 fours. When Root reached three figures, it was the first time in Glamorgan’s history for two players on debut to score a century in the same game, with Root becoming the 13th batsman to do so, completing his century from 150 balls. Both teams were eager to bat first on an easy paced pitch, and after Glamorgan had called correctly, Charlie Hemphrey, another Queensland debutant, and Nick Selman put on 27 before Selman nicked Buck to first slip. Hemphrey soon followed, edging Muzarabari to the wicketkeeper, before David Lloyd, with an attractive 31, helped Labuschagne put on 64 for the third wicket. Lloyd who struck seven fours, was the next to go, when he chipped Muzarabari to square leg, before Root joined Labuschagne to add 154 in the afternoon session. Labuschagne eventually departed, caught at long leg from a short delivery, but Carlson started with a flurry of boundaries, and outscored Root as he galloped to 50 from only 55 balls. Northants used seven bowlers, but none could make an impression on the fifth wicket pair, especially Carlson who dominated the final session. Glamorgan scored at such a rapid pace that they gained the fifth and maximum batting point in only the 92nd over, with Carlson reaching his ton from only 101 balls.